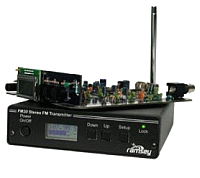 The FM30B Digital FM Stereo Transmitter Kit is designed around a tight vinyl clad metal enclosure for noise and interference free operation. It has a 25mW output and operates on 13.8V to 16V DC (includes a 15V DC plug in power supply). A two line LCD display and a front panel LED indicates the PLL lock so you know when you are transmitting. The display shows you the quality of the signal to help you set your transmitting levels for optimum sound quality. All your settings can be stored in the non-volatile memory for future use. The EMI filters on the line level audio and power inputs and a state of the art microstrip PCB inductor are included in the design. The radio-frequency output is through a professional, well shielded rear panel BNC connector for a perfect antenna match. The kit has a super audio quality that rivals commercial broadcasts! This small 7W Mono Audio Amplifier Kit is constructed around the TDA2003 IC capable of delivering 7 watts of music power into 4 ohms (or 2 watts RMS into 8 ohms) with a THD of 0.05% at 1W, 1 kHz. The signal/noise ratio is 86dB and the input sensitivity is 40mV/150Kohm. The IC is thermal overload and short circuit protected. The frequency response of this circuit is 20-20,000Hz. 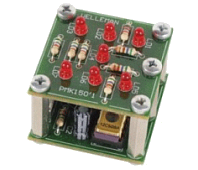 Requires a 15 VDC/500mA - separately sold - power supply. The kit's instructions are easy to follow, provided in many languages. All you need is a soldering iron, solder and you can start building. The LED Shaking Electronic Dice Kit is a microprocessor controlled circuit that acts like a real dice if you give it a shake! It rolls out slowly and flashes the last combination or winning number. The kit is constructed around a 12c508A PIC microcontroller. It has auto power on/off and runs on one 3V Lithium button cell.